ICE officers detained Rosiane Santos on Tuesday after they discovered she was in the U.S. illegally, Boston 25 News reported. Officials say Santos is an illegal immigrant from Brazil. Santos, who was living in Falmouth, was charged with disorderly conduct, assault and battery after a confrontation at the Casa Vallarta Mexican Restaurant last Friday. 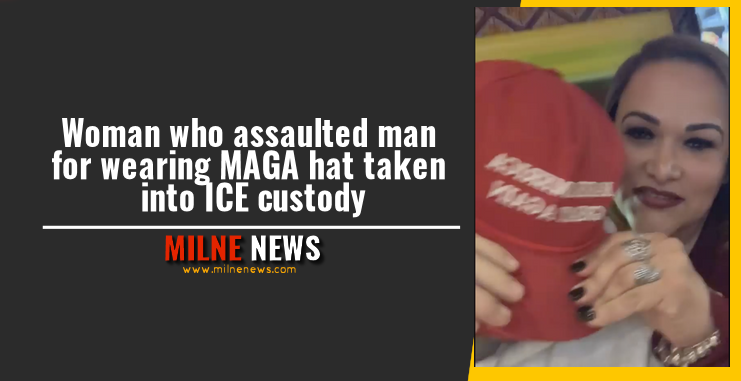 Bryton Turner, 23, told police he was at the restaurant when Santos started yelling at him because he was wearing his MAGA hat. Turner recorded the incident on his phone. In the video Santos is seen walking behind Turner and hitting the hat off his head, the report says. After police asked Santos why she was upset, she referred to the man with an expletive and said he should not be allowed to eat in a Mexican restaurant. A police officer helped Santos leave the restaurant, but while walking past the man she had assaulted earlier, she hit him over the head again. She was then handcuffed and arrested.